Dandelions make their debut in the spring, and with their arrival often comes the ever-burning question of how to get rid of them. When you want your lawn to look like a lush and uniform green carpet, interlopers that spread as easily as dandelions cause frustration. They do not pull up easily, and their seeds spread rapidly in the wind. Understanding the life cycle of a dandelion can help you to understand how to handle this plant when it appears in your lawn. The yellow blossoms of dandelions are among the first flowers to emerge in the spring. In fact, they represent one of the first crucial food sources for beneficial insects, such as honeybees, who pollinate dandelions by flying from plant to plant, transferring pollen from the anthers – or "male" components – of one to the ovules of another. However, fertilization does not have to happen this way. Dandelions can reproduce by self-pollination. In practical terms, this means that dandelions can spread their seeds even if pollinating insects have not yet emerged. Once the seeds have developed, the yellow petals dry out and reveal the seed head. Unopened, this looks like a slender green tube on top of the stalk with just a tuft of white feathery material peeking out. This tube soon opens up to reveal a round cotton-like head of seeds. Each seed head contains about 100 seeds located on the ends of those white feathery tufts. As you may know from having blown dandelion seeds as a child, all it takes is a light gust of air to distribute those seeds. The wind easily scatters dandelion seeds to new areas, which explains how they can easily "take over" a field. In fact, the wind can carry dandelion seeds for miles. Once the seeds settle into the soil with advantageous conditions, such as the right amount of moisture, they germinate and take root. Dandelions develop a deep, central tap root (think of a long, skinny carrot underground). This tap root allows them to pull nutrients and water from deep within the soil. Because they are perennials, once a dandelion establishes itself, it can come back each spring to produce even more flowers and seeds. The older a dandelion is, the longer its tap root and the harder it will be to remove. But before a dandelion grows that long tap root, it first must sprout – in other words, it must grow its first set of leaves in order to capture sunlight for energy production. It can do this within two weeks of settling into the soil. The first set of leaves quickly transforms into multiple leaves. The flowers grow next. 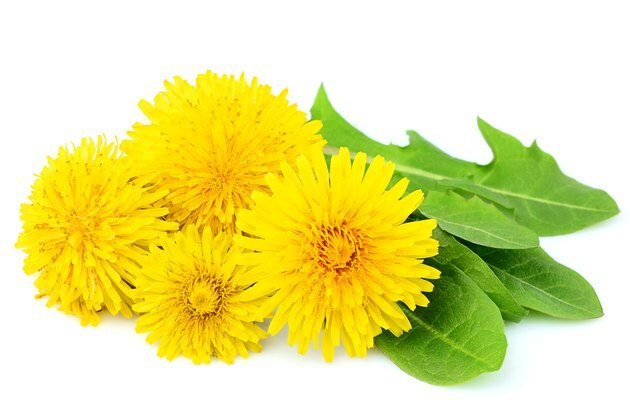 Dandelions always have multiple flower heads and stalks at the ready. You can see this for yourself by removing the main stem and leaves to reveal the round, green flower heads just below the surface that are ready to grow. If removing dandelions by hand seems like a never-ending battle, it may be because removing the blooms hardly slows down the plant. Removing the tap root stops the life cycle of the dandelion in its tracks. Once a dandelion successfully blooms, the life cycle begins again. How Do Dandelion Seeds Get the Fluffy & White Look?